I am going to focus on adult suicidality from Seroxat in this post. It is clear from the information in the previous posts how GSK hoodwinked the regulators for a licence to treat adults with Seroxat from 1991 onwards. They tried desperately to push for a licence to treat children with Seroxat as this would have increased its marketing profile, but they failed miserably.Also we can see from the previous links, that Seroxat clearly posed a danger to children and in the end GSK failed to prove the benefits outweighed the risks. The questions I want to ask here though are concerned with Seroxat use in the adult populations. If Seroxat greatly increases the risk of suicide, aggression and hostility in children with depression and other disorders then why wouldn’t it be the same for adults? No Doctor, psychiatrist or expert has ever been able to explain to me why the effects of Seroxat would be any different between a child or adolescent or an adult taking the drug. Why does GSK maintain that Seroxat is safe for use in the adult populations? when even they themselves admit that it can cause severe and dangerous side effects in children? Are we to believe GSK’s original Seroxat adult clinical trial data submitted to the regulators to be an accurate and true representation of Efficacy? Or, considering their history ,should we put our trust in an independently funded study? Well, there was an independent study done on Seroxat in August 2005. It caused a Media Storm at the time because it demonstrated that Seroxat is linked with up to a 7 fold increase in suicide compared to a placebo (sugar pill)… That means you are seven times more likely to kill yourself if you take Seroxat … And they prescribe this drug for Depression! ..
ONE of Britain’s most widely prescribed antidepressants has been linked to a seven-fold increase in suicide attempts. An analysis of trials for Seroxat involving more than 1,500 patients found seven suicide attempts among those taking the drug and only one among those taking a placebo. Suicidal thoughts were also commoner among those taking Seroxat (paroxetine), by a factor of three to one. Almost 2.4 million prescriptions for the drug were issued in England last year. The data was available even before Seroxat was first licensed in 1990, the Norwegian researchers found. The findings are likely to be seized on by lawyers attempting to win damages against the drug’s manufacturer, GlaxoSmithKline, in the US and in Britain. The mental health charity Mind said the results were “extremely worrying” and confirmed what it had been arguing for years. “By ignoring what mental health service users themselves have said about the medication and its effects, the drugs regulators may well have caused lives to be lost,” said Sophie Corlett, policy director of the charity. Campaigners, including Mind, say the drug should be withdrawn from sale, but GSK and the Medicines and Healthcare products Regulatory Agency (MHRA) have defended it, arguing that its benefits outweighed the risks. However the MHRA has said that too many drugs of this class, SSRIs (selective serotonin re-uptake inhibitors), have been prescribed, and has warned that they should not be given to under-18s. The MHRA also said that an increase in suicidal thoughts among users of Seroxat “cannot be ruled out.” The new study suggests that such an increase should have been apparent from the beginning. Sales of paroxetine have fallen sharply in the UK in the past three years after concerns about it were highlighted by the media. A team led by Ivar Aursnes of the University of Oslo looked at 16 studies in which paroxetine had been compared with placebo, including previously unpublished data. The trials covered a total of 190 patient-years of use of the drug and the results were published in the journal BMC Medicine. Ms Corlett of Mind said: “This study would seem to be an extremely worrying addition to growing evidence raising serious concerns over the safety of paroxetine. The MHRA said that while a modest increase in suicidal thoughts and self-harm could not be ruled out for those on SSRIs, there was insufficient evidence to conclude that there is any marked difference between different SSRIs, or between SSRIs and other antidepressants. Further concerns have been raised about potential suicidal side effects of a commonly used antidepressant. The drug Seroxat (paroxetine) is already banned from use by adolescents because of an increased risk of suicidal thoughts. In the journal BMC Medicine, University of Oslo scientists said existing studies indicated these warnings should be extended to adults. GlaxoSmithKline, which makes the drug, said it had helped millions. Paroxetine is one in a class of drugs known as Selective Serotonin Re-uptake Inhibitors (SSRIs). In 2003, around 19 million prescriptions for SSRIs were handed out in England for the treatment of depression and anxiety. Concerns over suicidal side effects for those taking paroxetine were first raised by the BBC’s Panorama programme in 2002. Last year the Medicines and Healthcare products Regulatory Agency’s (MHRA) Committee on Safety of Medicines concluded that a modest increase in the risk of suicidal thoughts and self-harm for SSRIs could not be ruled out, but the benefits for adults outweighed the risks. The Norwegian researchers, whose study was triggered by a journalist from the Norwegian Broadcasting Corporation working on a medical information programme, analysed the results of 16 trials involving the drug. The studies were presented to drug regulatory agencies in 1989, prior to the drug being licensed for use by doctors in the early 1990s. 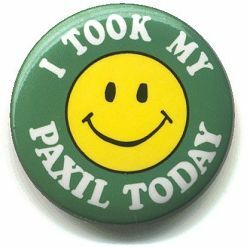 In each, patients had either been given paroxetine or a placebo (dummy pill). The researchers carried out a statistical analysis of all the results, taking into account the length of time patients were on the drugs. The studies included 916 patients on paroxetine and 550 patients on placebo. There were no actual suicides in any of the studies. However, there were seven suicide attempts in the group on paroxetine, and only one in the placebo group. Writing in BMC Medicine, the team led by Dr Ivar Aursnes, said: “Patients and doctors should be warned that the increased suicidal activity observed in children and adolescents taking certain antidepressant drugs may well be present also in adults. He added: “At this stage, it’s not clear what method the researchers have used to arrive at these numbers or which clinical trials they have selected. An MHRA spokeswoman said it kept the safety of all SSRIs under close review and all new evidence was carefully reviewed and considered to see if new advice was needed. Sophie Corlett, director of policy at the mental health charity Mind, said: “This study would seem to be an extremely worrying addition to growing evidence raising serious concerns over the safety of paroxetine. “It confirms what Mind service users have long been telling us anecdotally.